Handmade Crochet Round Rug in beautiful RED RUG. A great addition to any home. Here the crochet rug is placed as a front door mat/ rug, as an alternative to the usual bathroom mat or as an addition to the nursery or kids bedroom/play area or really any other room in the house. Made from 100% cotton This yarn is thicker than the standard yarn you find in stores and is of great quality. Works on carpet. If placing on hardwood or tile surface please spray backing with non slip spray prior to use. Spot clean or cold hand wash only with like colours and flat air dry to reshape the rug with cool iron if needed. Our amazing floor rugs are hand crocheted from a super-soft yet durable cotton and will make a gorgeous addition to any nursery or kid's room! 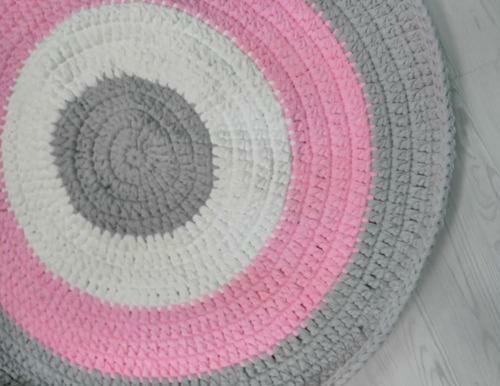 Handmade Crochet Round Rug in beautiful RUG. To prevent damage to your rug, please hand wash in cool water (using a mild detergent if necessary) and lie flat in a shady area to dry.